Heritage Court Menomonee Falls and Heritage Elm Grove invite you to join us as former WI GOv. Martin J. Schreiber shares lessons from his journey as a caregiver for his wife, Elaine, who lives with Alzheimer’s. 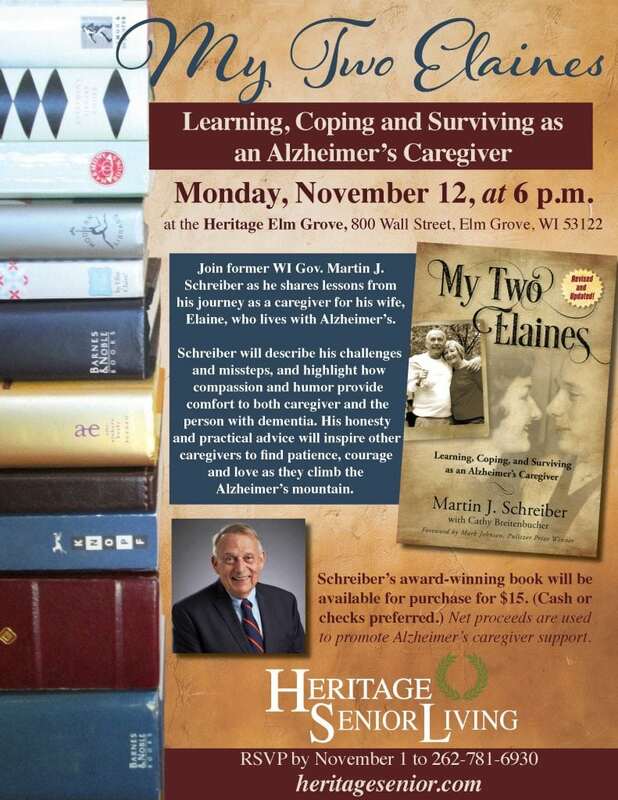 Schreiber will describe his challenges and missteps, and highlight how compassion and humor provide comfort to both caregiver and the person with dementia. His honesty and practical advice will inspire other caregivers to find patience, courage and love as they climb the Alzheimer’s mountain. Schreiber’s award-winning book will be available for purchase for $15. (Cash or checks preferred.) Net proceeds are used to promote Alzheimer’s caregiver support. Please RSVP by November 1 to 262-781-6930.